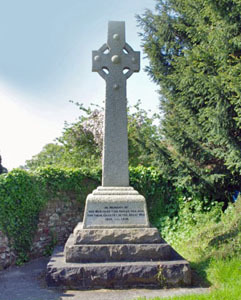 Located at the entrance to St. Andrew's churchyard, Cromhall, Gloucestershire, England. The list covers both the First and Second World War and includes information from the Commonwealth War Graves Commission. 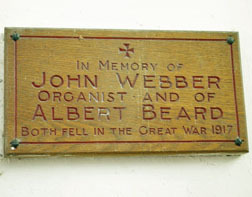 Photographs of the grave of Private G H HALL and of a memorial plaque to John WEBBER and Albert BEARD are also displayed. Alf Beard supplied the war memorial details. 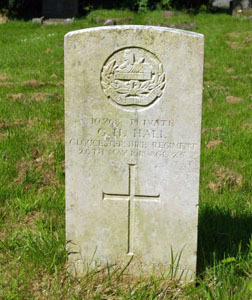 Private 10768 3rd Bn Gloucestershire Regiment. Died, age 25, on 20 May 1918 of phthisis following wounds. Died, age 24, on 22 October 1917. Commemorated on the Tyne Cot Memorial, panels 72 to 75. Son of John Ford Webber and Mary Ann Webber, of 332, Stapleton Rd., Bristol.